Pacific Honda Blog: Honda Wins Indianapolis 500! 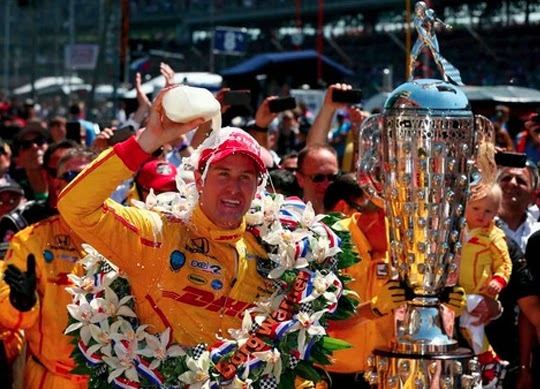 Honda-powered Ryan Hunter-Reay won Sunday's 98th running of the Indianapolis 500 at the Indianapolis Motor Speedway, edging Helio Castoneves by six hundredths of a second in the second-closed finish in "500" history. After running for the first 300 miles at the fastest pace in "500" history, a late-race red flag set up a six-lap shootout to the finish, with Hunter-Reay, Castroneves and the Honda-powered car of Marco Andretti in contention for the victory. Hunter-Reay's victory was the first Indy 500 triumph in his IndyCar career, but the third for Honda in the last three years. Honda's last win was in 2012 with Dario Franchitti. Ryan Hunter-Reay (#28 Andretti Autosport Honda) 2014 Indianapolis 500 winner: "This [Indianapolis] is American History, an American tradition. For me, this is more important than [winning] the championship. I hope the fans loved the finish, 'cause I was on the edge of MY seat! Thanks to my team, I love driving for these guys and thanks to Honda, we had an awesome engine today." Art St. Cyr (President, Honda Performance Development) on today's race win: "What a fantastic day, and an incredible finish. I hope all the fans loved it as much as we did. The entire HPD organization worked so hard to achieve this result – not just today, but starting months ago and all through the weeks here at Indianapolis. Their effort has been outstanding, and today's victory is reward for all of their efforts. This is our third win in a row, starting at Barber last month and the Grand Prix of Indy two weeks ago, and it feels like we on a roll. So we're really looking forward to extending that streak to four- and five-in-a-row at the doubleheader in Detroit next week!"